Creamy Milk Chocolate in a crispy shell! Our Milk Chocolate Gems are made with responsibly sourced, Non-GMO Project Verified ingredients that are naturally colored with vegetables and with nothing artificial. The taste may be UNREAL, but we can assure you the ingredients are all-real, and all good! 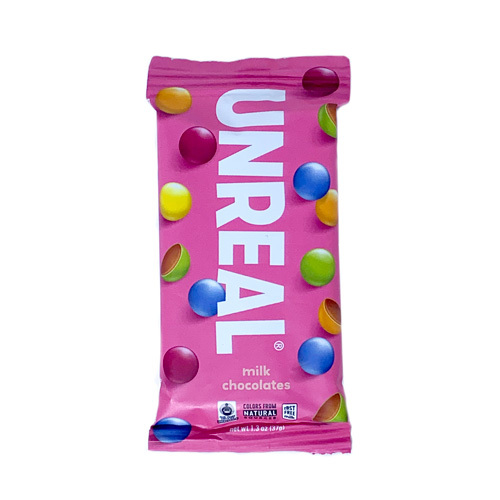 Unreal is on a mission to change the world, one snack at a time. This item may melt at temps 75° and up! Read Warm Weather Shipping info. Ingredients: Milk chocolate (organic chocolate liquor*, cocoabutter*, nonfat milk, whole milk powder, cane sugar*, organic blue agave inulin, sunflower lecithin, vanilla), organic cane sugar*, gum acacia, colored with (tumeric, beet juice, spirulina extract, red radish juice), organic tapioca syrup, carnauba wax. *Fair Trade Certified by Fair Trade USA. 66% Fair Trade Certified Ingredients. From the package: Made in a facility that handles peanuts, soy, tree nuts, wheat. Misc. info: Non-GMO Project Verified. Vegetarian info: This item is not vegan because it contains dairy. Kosher certification: Certified Kosher Dairy by The Organized Kashrus Laboratories (OK). Organic info: Contains organic ingredients. Each bag is 1.3 oz (37g) bag contains roughly 30 gems and is 2.5"x5.5".